Old toys, new toys, we all love ’em all, whatever their age, whatever their state. I have a Teddy Bear – they’re named after Theodore Roosevelt, you know – who was passed down to me by my brother. Actually, to be truthful, my brother didn’t so much pass Teddy down to me as throw him out of his cot in fright. He really didn’t like the ursine furball. But I did, and do, and we are often to be seen snuggling on a cold Martian night, searching for Earth in the evening sky. Even more often, though, we are searching for that wretch of a takeaway delivery hound with our Honeyed Tuna Melt Bites. It is also suggested that Theodore ‘Teddy’ Roosevelt said this: Start where you are, use what you have, do what you can. It will be enough. Try it out next time you are suffering in extremis and see if it helps. I think it will, friends and grasshoppers. You can only do what you can do, Honeyed Tuna Melt Bites notwithstanding. 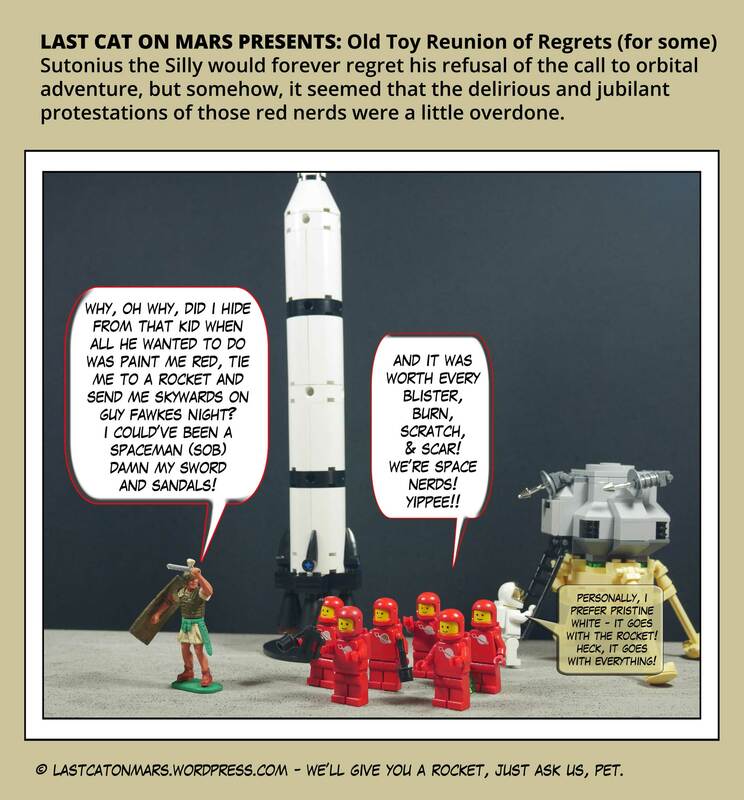 This entry was posted in Space, Variety Show and tagged astronauts, cartoon, comic, crusader, lego, minifigures, rocket, space on November 15, 2017 by Jay Verney. 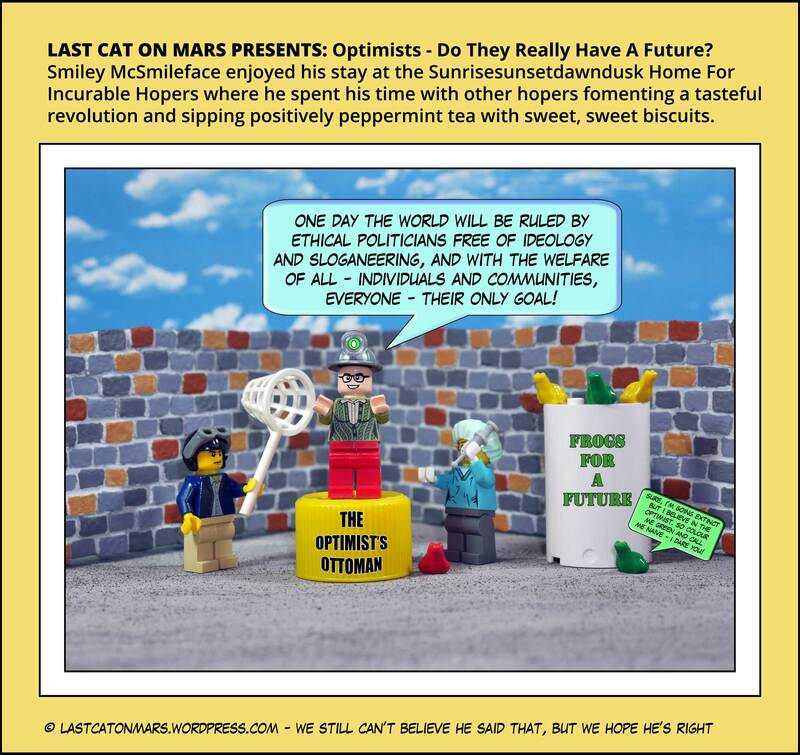 Last Cat On Mars Presents: Optimists – Do They Really Have A Future? Yes, I know, but Smiley McSmileface is not related to Moai McMoaiface, except for the face bit, and the Scottish connection. You try coming up with names for every single person who passes your Martian door and see how you go, pal. 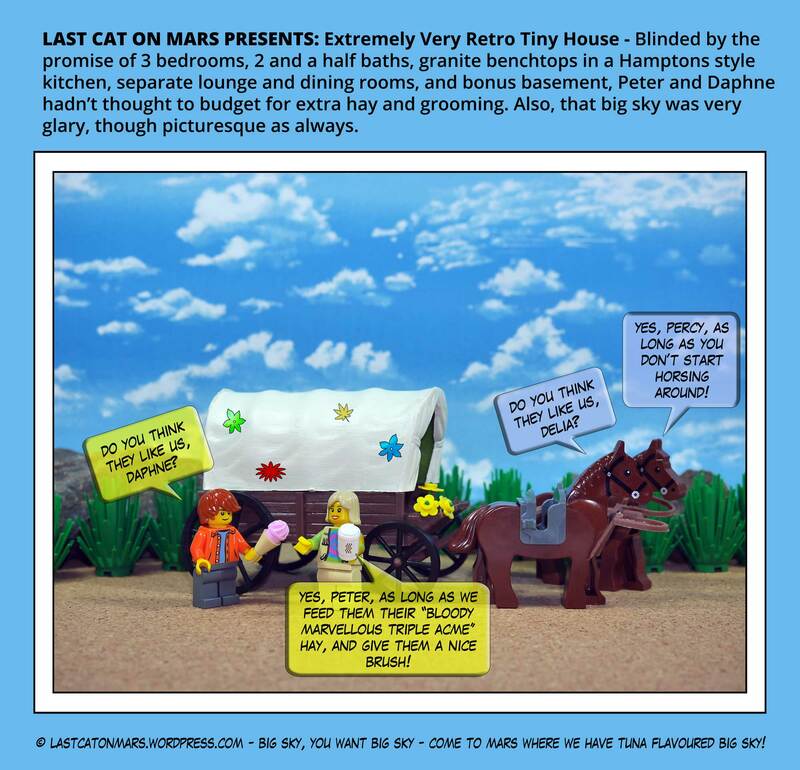 This entry was posted in Variety Show and tagged cartoon, comic, frogs, future, hope, lego, minifigures, optimists on November 1, 2017 by Jay Verney.